To give our readers better insight into the global mobile games industry we’ve teamed up with market data firm Sensor Tower to bring you exclusive weekly charts from key countries. Following its fall from the top spot of the App Store free download chart, King's Candy Crush Friends Saga has now dropped to second on Google Play. In its place is Voodoo's Paper.io 2. Other new top 10 entrants across the stores for the week included Voodoo's Fire Balls 3D and Miniclip's Golf Battle. Over on the App Store top paid games chart, Stardew Valley, a mobile port of the hit PC title from The Secret Police, entered the top rankings in second place, just behind Minecraft. As for the top grossers, Supercell's Clash of Clans worked its way up to third on both the App Store and Google Play. 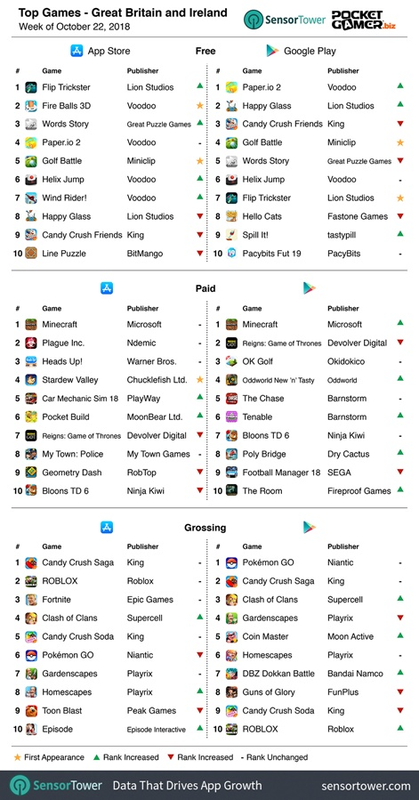 Fortnite remains the top seller on iOS, while Candy Crush Saga remained in top spot on Google Play. 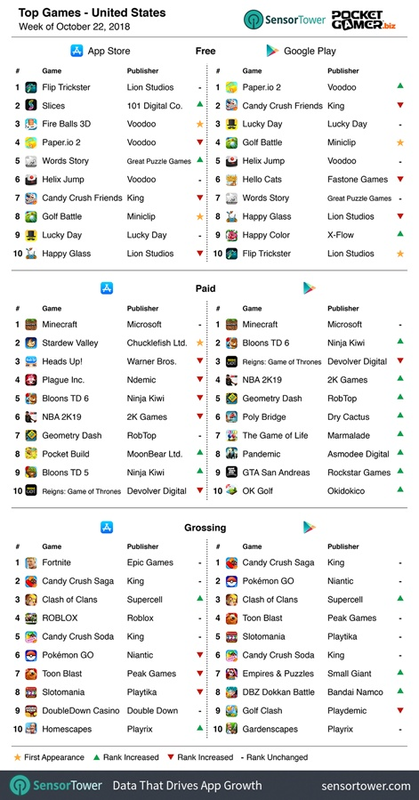 Just as in the US, Candy Crush Friends Saga fell off top spot across the marketplaces, with Lion Studios' Flip Tricker and Voodoo's Paper.io 2 taking first place on the App Store and Google Play respectively. Clash of Clans grossed well in Great Britain and Ireland, taking fourth on the App Store top grossing chart and third on Google Play. Other notable risers included Moon Active's Coin Master, which moved up to fifth on the Google Play top grossing list, and Pocket Gems' Episode, which took 10th on the App Store. 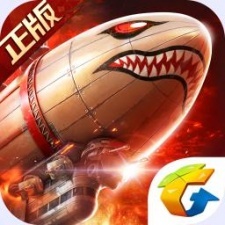 After flying to the top of the download chart the week prior, Tencent's Command & Conquer Red Alert Online dropped to third. In first was another Tencent game, Sausage Party, while the publisher also held second place with PUBG Battlegrounds. 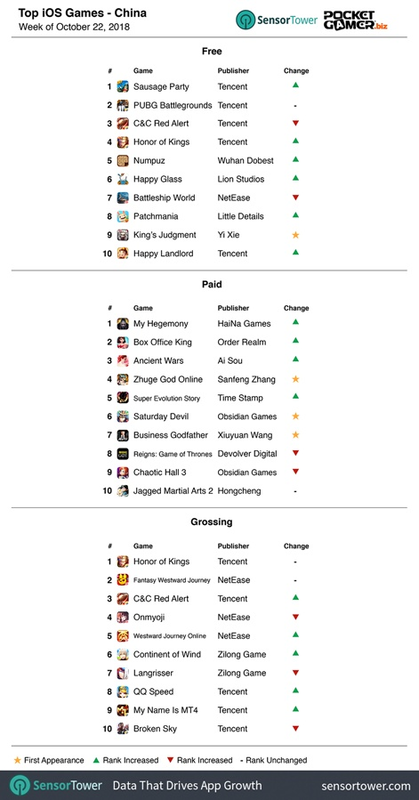 Despite its downloads ranking dropping slightly, Red Alert Online moved up to third on the list of top grossers. It remains to be seen whether the title can unseat heavyweights Honor of Kings and Fantasy Westward Journey, however.